Fuminori Nakamura was born in 1977 and graduated from Fukushima University in 2000. He has won numerous prizes for his writing, including the Ōe Prize, Japan's largest literary award; the David L. Goodis Award for Noir Fiction; and the prestigious Akutagawa Prize. The Thief, his first novel to be translated into English, was a finalist for the Los Angeles Times Book Prize. His other novels include The Gun, The Kingdom, Evil and the Mask, The Boy in the Earth, and Last Winter, We Parted. "You'll think about Nakamura's questions long after you've closed his book's covers. He uses the conventions of a genre to prop up a tent for big ideas about groupthink and individual responsibility. If you feel a few frissons along the way? Consider how easily you might be seduced into a cult, and then take a long, cold shower." "Raises the literary stakes to literally cosmic proportions . . . Cult X, translated into handsome, unadorned English by Kalau Almony, pushes the boundaries of the thriller genre to an extreme degree. Mr. Nakamura has written a daunting, challenging saga of good and evil on a Dostoevskian scale. Those who persevere to its finale may well feel the richer for it." "Nakamura's impassioned writing is part of a continuum that stretches from Dostoevsky to Camus to Ōe." "Nakamura’s talent for characterization and willingness to engage make this a novel worth wrestling with." "One of the most buzzed about novels of the season." "The Fuminori Nakamura novel we’ve been waiting for . . . [Nakamura's] talent has always been for exploring the lives of those on the fringes of society, the damaged and the ostracized, and that remains at the heart of this work." "Taking as his inspiration the 1995 sarin gas attack on the Tokyo subway, award-winning author Nakamura weaves together politics, religion, and science—including biology, cosmology, and quantum physics—into a fascinating noir brimming with insightful commentary on totalitarianism that is especially apt for our times." "Gripping . . . This noirish thriller will resonate with Ryu Murakami fans." "At its heart [Cult X] is an investigation—first for a lost woman, but ultimately into humanity's darkest motivations and the temptation to follow them." 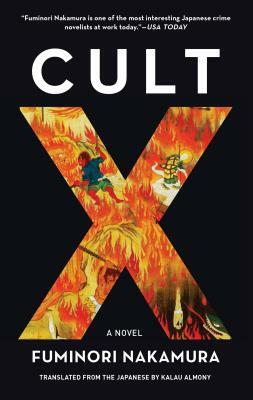 "[Cult X] twists adeptly toward a horror-laden plot of mass destruction . . . Horrifying, yes—but worth confronting." "The sprawling novel, told from multiple perspectives and with long forays into the science of the universe, is an epic endeavor that deserves to stand next to the works of Ellroy and Bolaño in the canon of lengthy crime fiction."